At last, I have a way to exercise in front of my TV without any contraptions (or other people) near my body but still with a way to get yelled at if my form is bad. No joke: Your Shape: Fitness Evolved has the potential to be a huge breakthrough in home fitness. This workout game isn't really much of a game. It's an interactive exercise program, a digital personal trainer powered by your Xbox 360, the new Kinect sensor and your TV. Get in front of that machinery and you can follow along to various workout routines or mess with a few simple games. The focus is committing to a workout and dropping calories, as the Kinect ensures your body positions are sound. Tuck those elbows! It's watching. This could be the next great way for you to get in shape, and the Kinect sensor in theory could read your actions better than any other home workout device. Can it really track you? Is this a breakthrough? Your Shape does a great job of making it look like the Kinect sensor is watching every move you make. As soon as you turn the game program on, you see what looks like some Star Wars Princess Leia hologram of yourself in your TV, matching all your movement. When you work out, you see that version of you moving right next to a virtual trainer. That visual syncing alone is a great aid for helping a user match their moves to the trainer. But? The Kinect sensor is also able to watch your joints and track the positions of your knees, elbows, shoulders, and so on. In this regard Your Shape can be too finicky. As you're hopping through a routine, you're expected to keep in rhythm. You are scored and calorie-counted based on how well you move into alignment. But I guarantee you that there will be times when you are sure you are stepping just as far out as the trainer — heck, you can see your hologram-self doing it — but the Kinect must think you didn't. The trainer sweetly tells you to stop wider. She thinks you're cheating too! There's no arguing. You don't get the credit. Hey, at least you'll get the burn. Are the routines any good? Did you sweat? It's not bragging if it's true, right? OK. My cardio is already very good. I can run four miles on a treadmill in under 27 minutes. My strength, for my size, is decent not amazing. I'm 5'6", weigh about 150 and can comfortably squat my body weight a dozen times before resting. I took Your Shape's fitness test. It incorrectly scored me as a cardio beginner due to the motion recognition issue mentioned above, but I re-took it and it recognized me for being very fit. It prescribed a tougher workout licensed from Men's Health, but in the early days of using Your Shape I still had to do several cardio workouts consecutively to get winded. I needed well more than the recommended five-pound dumbbells for a rigorous strength routine. Would the average person get a good workout from this? I think so. The huge font for the nearly omnipresent calorie counter shows that this program is targeted primarily at people who want to drop some pounds. They can sweat it out fine with Your Shape, choosing from a variety of workouts — many of them designed for women — and trusting the program to track their calorie-losing progress. No push-ups? Maybe I haven't unlocked them yet, but I've sampled many workouts in Your Shape and I've found none that requires me to get on the floor for push-ups, planks, sit-ups, nothing. That's too bad. There are all kinds of great exercises you can do while standing in front of your TV with Your Shape, from squats, to lunges, to aerobic boxing and Yoga poses, but why doesn't the program have you getting on the ground? It's not clear if the developers didn't think the Kinect could see you, if there is a problem with it interpreting a prone human form or what. Is there any game in here? Yes. A handful. 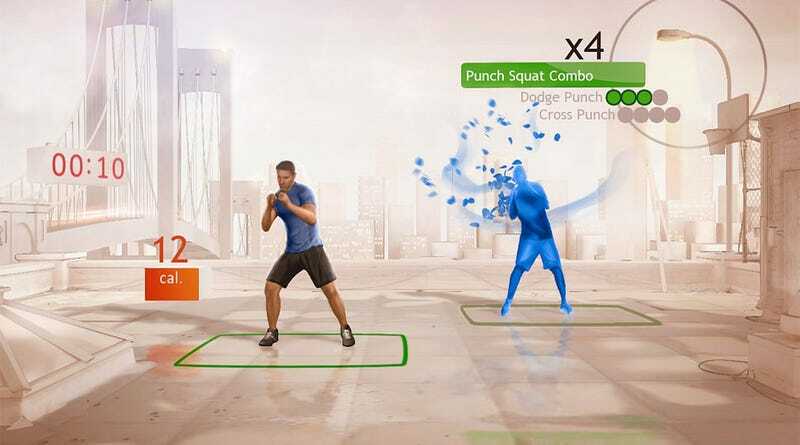 Your Shape includes several basic exercise games, including a hula challenge and a fun one that has you punching and kicking virtual blocks that are shown to be hovering on either side of your body. Calories are counted when you play these solo, but, oddly, they are not when you try the turn-based multiplayer. Anything else notable here? Your Shape's creators deserve high praise for the program's menu system. While most other Kinect games require you to use your hand to air-control a mouse cursor on your TV, Your Shape has a better alternative. The program uses Kinect to measure your arm-length and then places icons around the virtual version of your body on the TV that you can easily reach out and "touch" in real life. Touching them is as simple as setting your arm like a minute-hand as you select what you next want to do. Your Shape's menu method is comfortable, reliable and will hopefully be shamelessly ripped off. Your Shape: Fitness Evolved is the rough draft of something that could be great. A home workout system that can track and audibly correct your body movements would be a magnificent boon to people who can't afford or are otherwise unable to exercise outside of their home. Your Shape is not a great workout alternative for those who already have a fit lifestyle. It may not be ideal for those who want some of the long-form workout-tracking that competing exercise games offer. Nevertheless, it is an advance, a worthy option with an exciting future. Your Shape: Fitness Evolved was developed by Ubisoft Montreal and published by Ubisoft for the Xbox 360, released on November 4. Requires Kinect and will require dumbbells if you are interested in toning or strengthening your arms. Retails for $49.99. A copy of the game was given to us by the publisher for reviewing purposes. Played all the mini-games but focused on several days' worth of workouts, burning more than 400 calories overall.